A ball valve is a quarter turn valve that can control the flow of a gas or liquid through a hollow pivoting ball. They are reliable, durable, offer good sealing, usable for a wide array of media, and have a long service life. 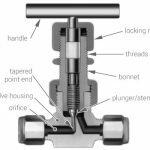 Understanding the differences in ball design, bore design, and materials used in a ball valve will ensure it is specified correctly for the application. Ball valves are often used on water lines, low-point drains for fluids, high-point vents for gas, steam services, or gas processing applications. 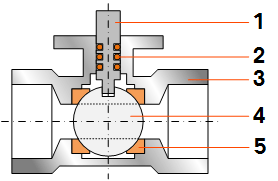 Figure 1: Sectional view of a manually operated 2-way ball valve. A ball valve is a quarter turn valve that can control the flow of a gas or liquid through a hollow pivoting ball, as seen in Figure 1. 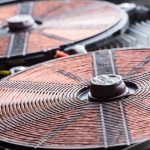 They are often chosen for their reliability, durability, good sealing, wide range of media options, and long service life even when used infrequently. This article will discuss their operating principle, valve design options, and typical applications where specifying a ball valve is common and good practice. 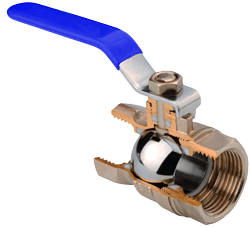 Most ball valves are manually operated with a handle. When a user rotates the handle 90 degrees, it turns the valve stem (1) and ball (4) with it. The ball has a hole through it, as seen in Figure 1, which allows the flow to move through the valve when the handle is parallel to the connected pipe or hose. When rotated back 90 degrees, the hollow portion of the ball is perpendicular to the flow preventing the flow of the gas or liquid through the valve. The valve seat (5) allows for proper sealing around the rotating ball to prevent media from going around the ball. The O-rings (2) allow for proper rotation and seal of the valve stem. Depending on the media type, different housing (3), ball (4), and valve seat (5) materials are available to ensure no corrosion during operation. Figures 1 and 2 show the most common ball valve design, a “floating ball design.” In this design, depending on the pressure direction, the ball compresses against one of the valve seats to provide a seal and support. When the pressure direction is from the opposite direction, the ball is pushed in the other direction against the other valve seat. However, if the application requires a large diameter and high operating pressures (for example DN>100mm and 30 bar), then a “trunnion” design is better fitted. This design incorporates small protruding shafts at the bottom and top of the ball that are mechanically supported within the valve housing. This allows for a sturdier design, which is needed for high pressures and larger ball valves. Reduced bore: The bore is slightly smaller than the pipe size, which introduces minor friction (or pressure) losses in the system. However, they are the cheapest type making them the most common. Full bore: The bore is the exact same as the pipe size, creating no friction losses. This is needed for free flowing applications and when cleaning (pigging) is required. V-shaped: The bore is V-shaped (small end up stream), which allows for more precise control of the flow. This allows for linear flow characteristics, but requires a more robust design due to higher velocities and wear. The valve housing, ball, seats, and o-rings can be specified to be different materials based on the application requirements. Depending on the media temperature, pressure, and the chemical resistance needed for the media, a different material may be selected. 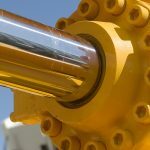 It is important to understand your media characteristics to properly specify your valve to ensure a proper seal and no corrosion of the valve to ensure proper performance and life time. A manual ball valve is used in a wide array of applications. As long as the application doesn’t require frequent throttling, has a low flow rate to prevent a water hammer, and a non-contaminated media (unless you have a 2 or 3-piece ball valve for cleaning) it is typically a good option. You will often find them on water lines, low-point drains for fluids, high-point vents for gas, steam services, or gas processing applications. Need a 2-way ball valve? Visit Tameson’s online store for a wide range of bore sizes, material selections, and pressure ranges giving you a valve you can count on at the lowest price for any application. If you need further information or assistance, please visit Tameson’s technical information center.